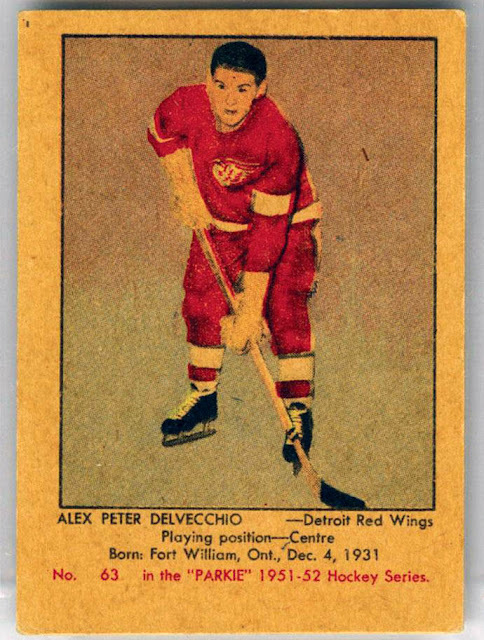 Alex Delvecchio is the original team player. 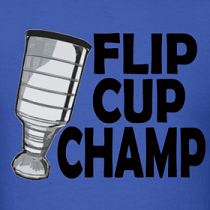 During his career in the NHL he played in 24 different seasons amassing a total of 1549 games. 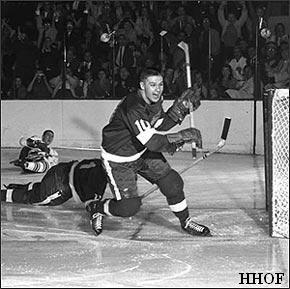 What is most impressive about this feat is he did it all with just one team, the Detroit Red Wings. Like Pentti Lund from last week, this week’s TTM grew up in what is now the Thunder Bay area and in my opinion (with all due respect to the Staal's, Lund and the many other TB players) he is the best to ever come from Thunder Bay. Three Stanley Cups, Three Lady Byng Trophies, 13 All-Star games, 456 goals and 1281 points are all great accomplishments. One of the most impressive feats I respect from his long and illustrious career was even at the age of 40, Alex scored 71 points in 77 games which was good enough for 3rd on the team (and 4th highest point total by any 40 year old NHL player). Another neat fact is that Alex didn’t even start playing organized hockey until he was 12 years old! 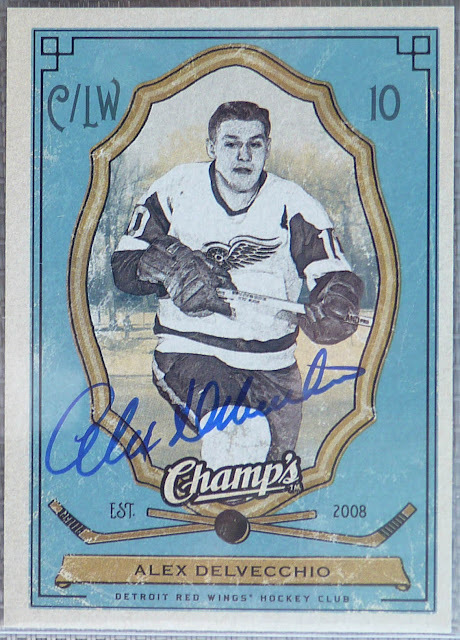 Alex would eventually be inducted into the Hockey Hall of Fame in 1977 and then his number 10 would be retired by the Red Wings in 1991. Needless to say, I grew up a big fan of Alex’s and writing him was definitely on my to-do list. Here is what Alex Delvecchio’s rookie card looks like, it is on my shopping list at the moment and I am sure it will make its way into my collection some day, just not yet. This card is from the 51/52 Parkhurst set. Alex only appeared in one game during the 50/51 season so Parkhurst didn’t bother listing his stats. I mailed away two cards on July 28th and 25 days later, both arrived back signed. The first card was from the 09-10 UD Champs set. This set is a throwback set from the 20’s when these cards would be in packs of Champs Cigarettes. I like the retro look of the cards and thought it would be nice to get one of them signed. He has one of the best signatures I have ever seen on a retired player, especially one that is 80 years young! This card was an insert from the 91/92 Parkhurst set. I like this card a lot, and now that it is signed it looks even better. It is my favourite between the two autos and the choice of blue sharpie really makes the auto POP off the card. Definitely a classy return from a classy player! How much is that worth Dave? One in near-mint condition is in the 275-400 dollar range. The one I posted is probably worth around 300 bucks. Of course, mint ones can sell for a pretty penny ($600 + higher). I am with TJ, love old school cards like this. 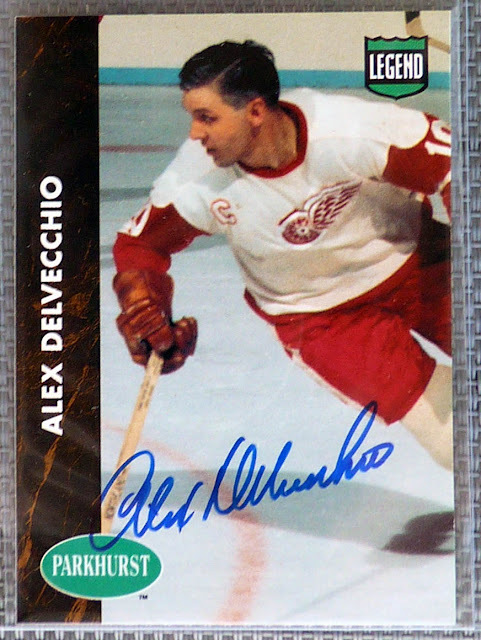 It's odd seeing Alex Delvecchio with the C on his jersey but on the wrong side. The Wings have the C on that side... Lidstrom has it, its one of the reasons I dont like Detroit.